EFFICIENT Only 15-20ml of Bathe+ diluted in ca. 12 liters of water is enough to both cleanse the bodywork of your vehicle and leave a smooth, self cleaning and hydrophobic layer. EASY TO USE/TIME SAVING When it comes to all-in-one products, Q2M Bathe+ can be claimed to be revolutionary! Just a quick wash is enough to obtain a marvelous hydrophobic effect and easy maintenance for the next couple of weeks. It is a phenomenal solution for the wintertime, when washing gets harder and the boost in self-cleaning abilities improves the comfort of vehicle maintenance. 1ST EVER SIO₂ SHAMPOO Q2M Bathe+ is the world’s first pH neutral shampoo containing SiO2. Even a quick wash leaves a strong hydrophobic layer, repelling water, dirt and prolonging the need for a next wash. 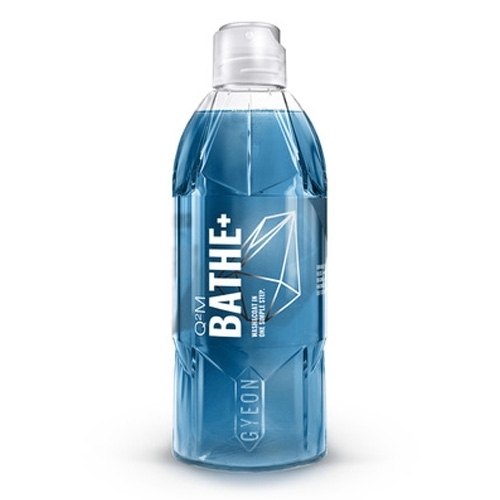 The wash itself is a real joy, while the shampoo is very slick and has a scent characteristic of the whole Gyeon range. SAFE ON PAINT, GLASS & RIMS Q2M BATHE+ is perfectly safe on all surfaces including paint, rims, glass and plastic and it will add instant protection to bare surfaces or boost the base quartz coating you already have on these surfaces. It can also be used over existing natural waxes or sealants improving their durability and gloss. And the real proof is when you rinse off the car – you can see the added protection with water beading off for yourself! ADDED SELF CLEANING The active SIO2 ingredient adds real protection that you can see every time you wash, unlike many so called ‘wash and wax’ shampoos, you are left with added hydrophobicity and self-cleaning ability that keeps your car actively cleaner for longer. However this amazing car wash is pH-neutral and therefore delicate finishes such as nickel / chrome plated or highly polished elements remain pristine.